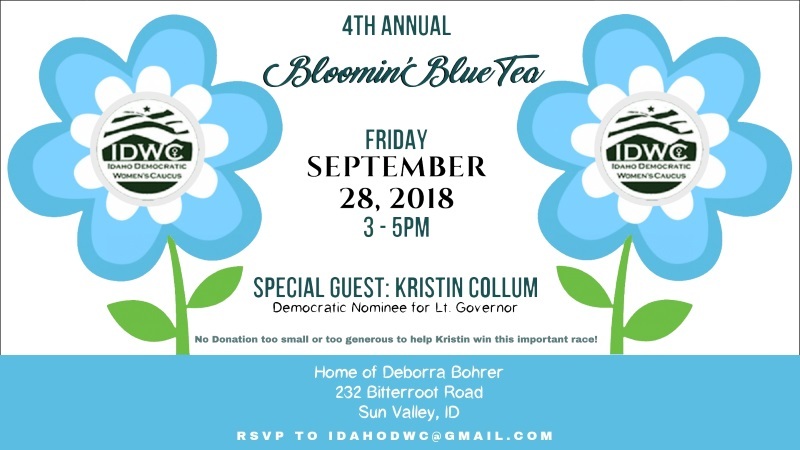 The Idaho Democratic Women’s Caucus will present the fourth annual Bloomin’ Blue Tea from 3 to 5 p.m. on Friday, Sept. 28. This year’s special guest will be Kristin Collum, the Democratic nominee for Idaho’s Lieutenant Governor. The event will be held at the home of Deborra Bohrer, 232 Bitterroot Road in Sun Valley, Idaho. Tea, wine and light refreshments will be served. Collum is a U.S. Army veteran who served as an Army Mustang. She spent two years at the Pentagon working for Gen. Colin Powell. After an honorable discharge, she worked as a software engineer at Micron, Hewlett-Packard and the water technology company Xylem. Kristin Collum is running to advocate for women, children and underrepresented minorities. The tea is open to men and women. “No donation too small or too generous,” said Gina Ballou, president of the Idaho Democratic Women’s Caucus. RSVP at idahodw@gmail.com.